Open: Monday to Saturday 7 a.m. to 5 p.m.
Fees: Minimum 2 yds = $8: Additional yards = $4.50. Location: 925 American Way, Paradise Ca 95969. Open: Tuesday - Saturday 9 a.m. to 4 p.m.
Fees (see below): based on yardage, all loads must be covered (additional $10 for uncovered loads). All loads must be covered with no material sticking out or dragging. Pets and children are to remain in the vehicle at all times. No smoking. Cash or check only, no bills over $20 and no change accepted. Please no garbage. Grass, Leaves, Tree Limbs, Weeds, Clean Wood, Wood Chips, Green Plants, Garden Trimming's, Clean Pallets, Pine Needles and Stumps up to 26" diameter. 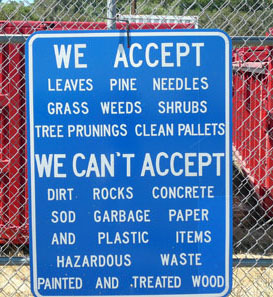 Dirt, Rocks, Concrete, Sod, Garbage, Paper, Plastic Items, Hazardous Waste, Painted or Treated Wood. 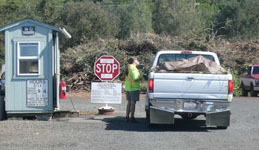 Customers can pick up or drop off clean pallets for FREE. NOTE: Pursuant to authority vested via the provisions of section 5.07 of Article 5 of the “franchise agreement” between the Town of Paradise and Northern Recycling & Waste Services [NRWS] the Town Manager has adopted the above-noted updated and revised gate fee schedule on December 15, 2009, and with an assigned legal effective date of January 2, 2010.